Georgian Jewelry was made approximately between 1714 - 1830. Ladies, when you Invest in Georgian Jewelry you have a recession-proof investment which is certain to increase in value, due to the rarity factor alone. "Regency style" is a term, used mainly in Britain, to describe this period in Decorative Art History, while "Empire" was adopted in Sweden, Germany and Austria. "Empire style" was based on features of the Roman Empire and its many archaeological treasures which in context, had only been discovered in the early 18th century. Empire influenced the American style referred to as "Federation-style" characterized by motifs of eagles, bellflowers and thunderbolts. The jewels of the 18th to mid 19th century in Europe and England, were largely influenced by the taste of the French Emperor Napoléon Bonaparte, whose enthusiasm for art, fashion and jewelry were eclipsed only by his enthusiasm, for "France, the Army and Josephine" - Napoléon's famous last words. Despite the French revolution of 1789, when a pair of fancy shoe buckles might be enough to condemn you to the guillotine, France managed to hold on to her role as the leaders of fashion and jewelry and the extremely talented jewellers of France, together with Napoléon Bonaparte's obsession with art, fashion and jewelry, (arguably used for political motives) were two of the reasons why. The Georgian, Louis, Empire - whatever term you personally like to call this period in Jewelry History was known as "the great age of aristocracy" and commenced with the death of Louis XVI in 1715. Closely following trends in architecture and interior decoration, including Rococo, Greek and Roman, Pompeiian, and Gothic; Georgian architecture influenced Antique Georgian Jewelry. Georgian jewelry can be divided into three distinct styles. In Britain, the new style of "Rococo" might have coincided with George 1sts' reign but it originated in Paris in the 1730s. Early Georgian Jewelry reflects the gaiety and opulence the Georgians enjoyed in the new age. Rococo style was curvilinear, over elaborate, complicated and involved highly decorative floral, shells, jeweled flowers, foliage and scrollwork patterns. The use of large stones set in an elaborate rococo style was fashionable in Georgian times. Rococo was a departure from the symmetrical arrangement of gem-stones. Leading exponents of the style among jewelry designers were Girolami Venturi (c. 1739), Thomas Flach (c. 1736), Albini (c. 1744),and Christian Taute (c. 1750). In the second quarter of the 19th century in the history of jewelry, there was a period of 'revived rococo' style. All Georgian Jewelry was handmade. This is one reason why Georgian Jewelry is so desirable today and a favorite antique jewelry of collectors. Essentially in 18th century Georgian Jewelry is the ever present girandole motif, consisting of a surmount, bow and a three-drop form. Glass paste copies of real gems were developed as well as a substitute for gold called "pinchbeck" named after its inventor. It was a cheap replacement for gold and was used for imitation pieces. Good quality Gold with high karat content was preferred. However, Berlin iron made in that city from 1806 was popular during the Napoleonic Wars as a show of patriotism. Antique Berlin iron jewelry is also very collectible today. Diamonds were used to the almost total exclusion of other stones. Read the Facts About Diamonds Here. To meet the increased demand for white stones in the first half century, the Georgians employed, paste, rock crystal, marcasite, and cut steel with increasing sophistication. Diamond alternatives were soon produced with such quality that it was entirely respectable for even royalty to wear them. The best and most long lasting paste jewelry was produced after 1734 by Georges Stras, (1701-1773) who gave his name to paste jewelry in France. Stras invented an imporved flint-glass and a method of colouring foils for tinting diamonds. (Evans, J., 1989) A History of Jewellery, Dover Press . Stras was a distinguished jeweler who handled diamonds as well as paste. At this time diamond cutters were introducing exciting new types of gem cuts such as rose cut, cushion, and 'brilliants' that sparkled well by candle-light. Thanks to the Venetian Vicenzo Peruzzi, who introduced the brilliant cut around 1700. From the outset, the first design of pasted jewels approximated with a surprisingly small time-lag to those of diamonds. Early Georgian paste is often rose-cut, like the diamonds it imitated. Unlike the open work favored today for gem stones, the Georgians set gems over gold or silver foil with their backs enclosed with metal as rhinestones generally are today. It has only been in recent times, that jewelry foil backed always indicated a fake stone. 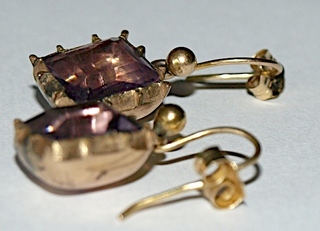 This particular pair of earrings are a good example of close-back mountings of copper gilt. The ear wires have been adapted later and are 10kt gold. Dating to the 1810-1820s, and showcasing Siberian amethysts, these have not been colored enhanced and weigh approximately 2.5 carats each. The effect of the copper gilt mounting and the medium violet purple of the amethyst make the color of the amethyst an unusual shade of rose-gold color almost a pale bronze color. The rim which encompasses a jewel, which is called the bezel, in Georgian Jewelry will often frame foil backed stones, low flat gold-work and cobalt blue and black and white enameling; all common features of Georgian Jewelry. Some Georgian pieces, for example a Georgian ring, can be detected by the way in which the stones are mounted. In the 1750's, colored stones were back in vogue. Emeralds, rubies, and sapphires were back in vogue along with new stones like white-imperial-pink topazes, amethyst, chartreuse chrysoberyl, coral, ivory,Pearls, and garnets. By the early 19th century, it is obvious, French supremacy in jewelry design had been firmly re-established. This was due to Napoléon's enthusiasm for the development of French arts, fashion and technology. In the second decade of the 19th century a remarkable form of Antique Gold Work called Canetilled gold was introduced that produced light and luxurious jewelry. So named after the gold embroideries of the Napoleonic years. 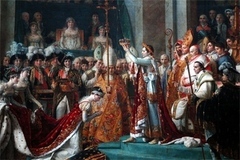 Napoléon Bonaparte regarded the luxury of his court as an aspect of national prestige and complete matching jewels known as parures began to be worn. The favorite earrings of the time were long pearl or diamond pendeloques, a favorite of Empress Eugenie. In 1886, many of the French Crown jewels were auctioned. (opens new window). Eugenie, "the Catholic Heart of the French Empire" was the fashionable wife of Charles Louis Napoléon (1808-1873), son of Louis Napoléon, the president of France in 1848-1852 and emperor in 1852-1870, reigning as Napoléon III, he was the nephew of Napoléon Bonaparte. Eugenie was the daughter of a Spanish officer and her mother was from Scotch Roman Catholic descent. A Spanish countess, born in Granada, Spain, in 1826. 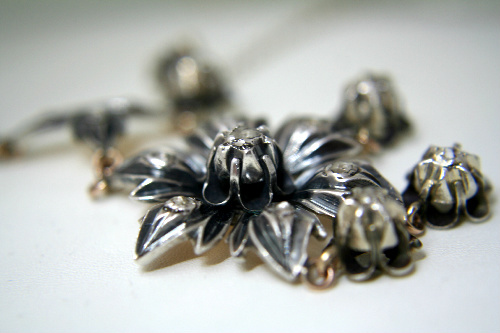 Neoclassic elements in jewelry designs started to appear around the 1760's. Napoléons interest in carved gems followed the Italian campaigns of 1796, when cameos were bought back to France from Italy. Neoclassical style is divided into Early Neoclassical and Late Neoclassical. Neoclassical style was inspired by Classical mythology, further inspiration came from new discoveries of ancient artifacts at the ancient Roman sites of Herulaneum and Pompeii. The 'Grand Tour' also helped put neoclassical style firmly on the map. It had become an integral part of a good education and took in the recently evacuated sites of Italy including Pompeii. Neoclassical shapes are generally more geometric. Scrolls and garlands were a popular theme. Decoration tended to be on the light and restrained side. Cameos and Intaglios were revived during this period and reflected the love for Neoclassical design. Napoléon opened in Paris a school of gem engraving which boosted the production of cameos of Classical Greek mythology. The cameo trend was adopted throughout Europe. There was also a revival of Ancient Egyptian motifs of hieroglyphs, scarabs and lotus flowers. Italian Antique Cameo available for purchase. Please Enquire Here. 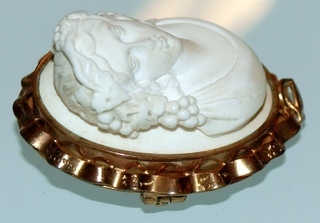 The Bacchante lava cameo brooch was carved in the 1840s. Antique Cameos and micromosaic medallions, recalling scenes of antiquity, were in keeping with the political mood. Design elements of Neoclassical Georgian Jewelry also may include laurel leaves and bands of Greek key patterns arranged with geometric precision that were taken from antique architecture (as ancient jewelry was relatively unknown). A cameo diadem carved from a single shell, depicting a scene from greek mythology, framed by gold, pearls and precious and semiprecious stones, was a present to Josephine from her brother-in-law Joachim Murat. Simply marrying into the Bonaparte family was like opening a treasure chest. When Napoléon remarried, while Josephine retained all except the Crown Jewels, his second wife, Marie-Louise was given new parures of diamonds, of pearls, of emeralds, rubies, of sapphires and of opals and diamonds. The famous "Napoleon Necklace" assembled in 1811, was presented by Napoléon Bonaparte to Marie- Louise, to celebrate the birth of their son. Composed of 234 diamonds it weighs about 263 carats and is currently on exhibit at the National Museum of Natural History, Smithsonian Institution, in Washington, DC.